Gwen Frankton is an artist whose story shows how Ecology Ottawa supporters are using their talent, time and effort to make a difference. Gwen has been painting images of the natural world for decades. Her love for nature was cultivated from a young age by her father, a botanist and author. Two years ago, she learned about the Emerald Ash Borer crisis destroying a quarter of Ottawa’s tree canopy. Moved by this news, and inspired by Ecology Ottawa’s work to plant, protect and promote trees across the city, Gwen decided to use her medium of art to help spread awareness of the issue while raising funds for Ecology Ottawa. To draw attention to the Emerald Ash Borer crisis, Gwen started her ‘Marked with an X’ installation, which involves hundreds of little tree paintings, one quarter of which are Ash trees marked with an X. 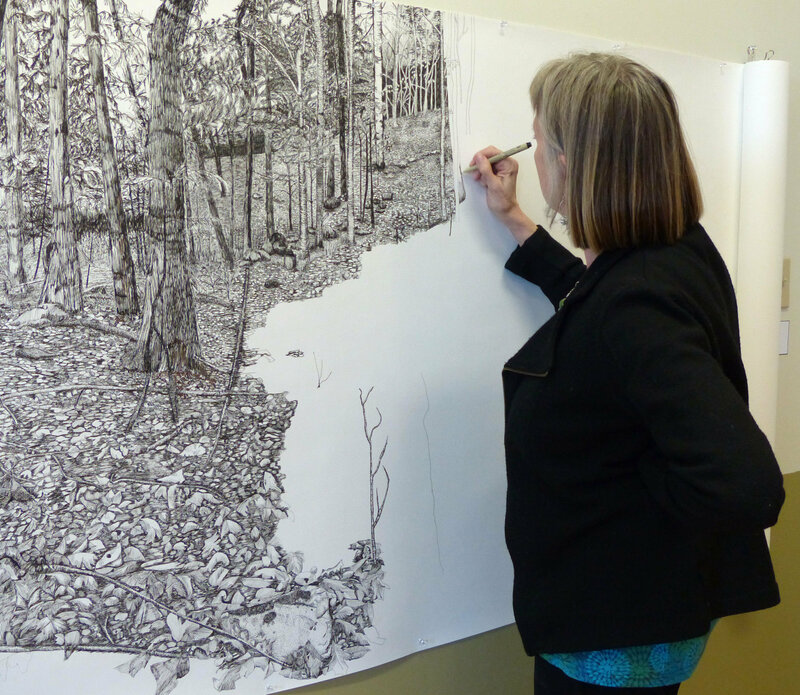 “I find that when I create drawings and paintings of the natural world viewers often respond as if I were telling a story that is personal to them,” Gwen says. “I wanted to support Ecology Ottawa’s work of planting and protecting in a way that would bring people’s awareness of the loss of so much of our urban forest to that deeply personal level.” Gwen’s installation has been put up three times over the past two years and has raised almost $3,000 so far. Gwen’s story shows us the power of one person to make a real difference. On Giving Tuesday, we’re asking you to consider making a contribution of your own. Giving Tuesday is a day dedicated to giving back – across Canada and in communities like our own. Will you donate $25 today to help us make Ottawa the green capital of Canada? Donations help plant trees, protect rivers, replace asphalt with greenery, make streets safer and reduce emissions across Ottawa. They help communities across the city to take action on the local environmental concerns that matter most to them. We’re proud of the work we’ve done, and we look forward to building on the incredible momentum of the past year to make meaningful and lasting change for the city we love. Please help us make this happen – make a Giving Tuesday contribution of $25 today.